We are Charles Wood Funeral Directors, serving our local community in Brighouse. We arrange and conduct bespoke funeral services with kindness, compassion and respect. 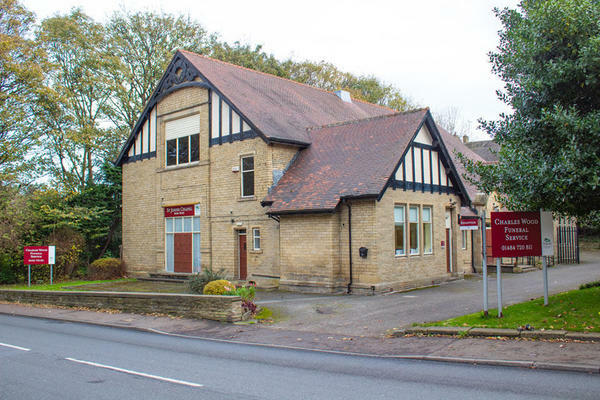 Our funeral home was built by St Johns Ambulance around 100 years ago, and has a large service room for you to use which can hold up to 60 people, should you wish. From our West Yorkshire home, we are able to conduct all kinds of funerals including woodland burials and colourful celebrations, as well as more traditional funeral services. We are here to support you and your family during this difficult time, we will do everything we can to make things a little bit easier for you. You can rely on us to provide advice, guidance and support, so please get in touch. You can reach us 24 hours a day by telephone. Call us today on 01484 720811 to talk through your personal requirements. At Charles Wood Funeral Directors, we understand how special life is with those that you love. For us, every funeral is unique and personal. We have a service to fulfil every wish, with every detail carried out with the same uncompromising quality of care. From a traditional service, to a colourful woodland burial, your options are limitless with our Full Service Funeral. If you have a little more flexibility when it comes to arrangements, then we can provide a Simple Funeral for a lower cost. We are approximately a quarter of a mile from Brighouse Climbing Wall. Our staff are available 24 hours a day on 01484 720811 if you require our services outside of these hours. We were very impressed with the high level of service we received, obviously at a very difficult time. From our initial meeting through to the actual service - thank you. Thank you for the professional manner in which you dealt with the funeral. The memory box given was a very touching gesture. Your professionalism made sure that everything ran smoothly and without any hitches, and I would highly recommend your services to others. Professional service and friendly respectful staff. All our questions were answered and all our requests kindly met. Simple straight forward easy operation. Everything we asked for was completed and extra questions answered when necessary.